If you’re a bacon lover you won’t want to miss the 8th annual Bacon Bash at O’Toole’s Restaurant Pub! There will be bacons to sample, eat, purchase and win. We’ll have sampling, additional bacon menu items, drink specials and prizes. Don’t miss it…. November 24, 2018…. 6-8pm at O’Toole’s in Albany. O’Toole’s will have a full range of new menu items for the bacon lover. 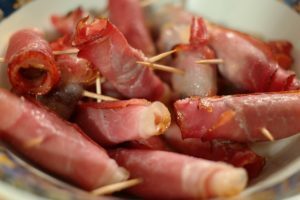 Bacon meals … bacon desserts …. bacon drinks … See the details on the menu below. If you're a bacon lover you won't want to miss the 8th annual Bacon Bash at O'Toole's Restaurant Pub! There will be bacons to sample, eat, purchase and win. We'll have sampling, additional bacon menu items, drink specials and prizes. Don't miss it.... November 24, 2018.... 6-8pm at O'Toole's in Albany.